The plan? 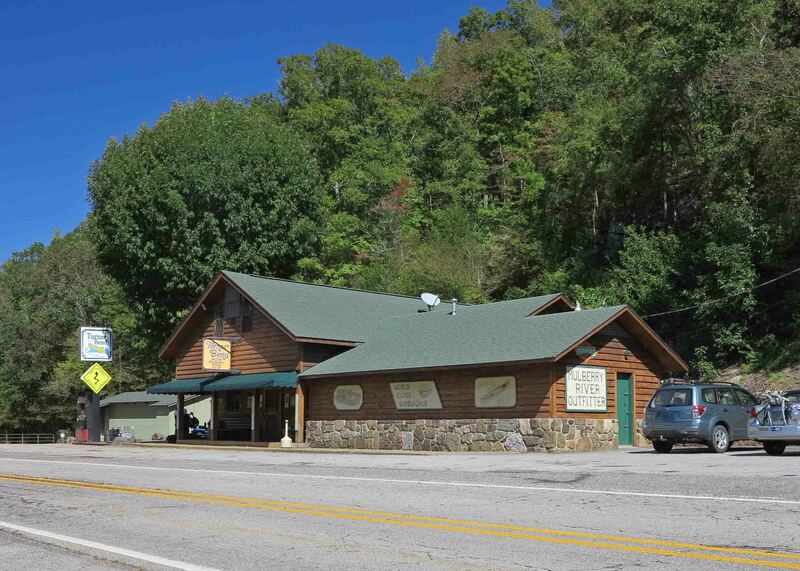 Meet at a favorite Ozark landmark, Turner Bend Store on Highway 23 (AKA The Pig Trail). 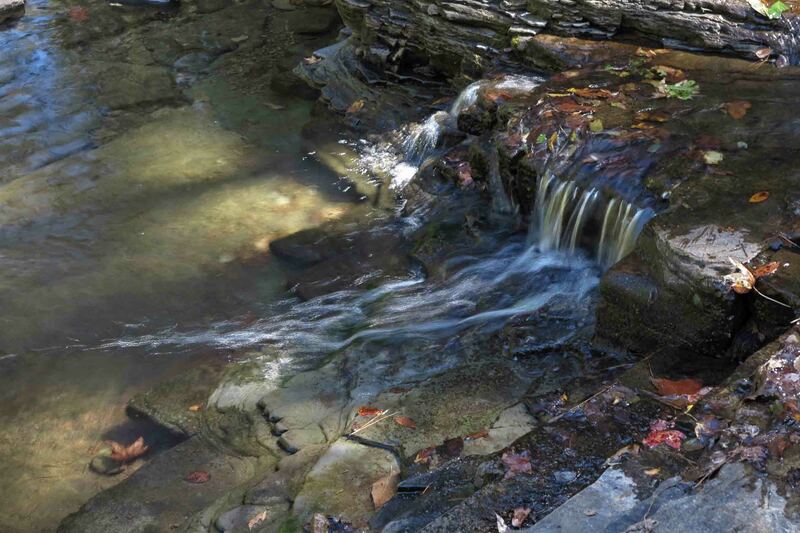 Then drive a short distance to Fanes Creek Trail Head, near mile 31 of the Ozark Highlands Trail. Hiker-dog was bouncing and hyper Saturday morning, celebrating cooler fall temperatures; Sunny and 41 degrees! She was beside herself as I loaded the Jeep. 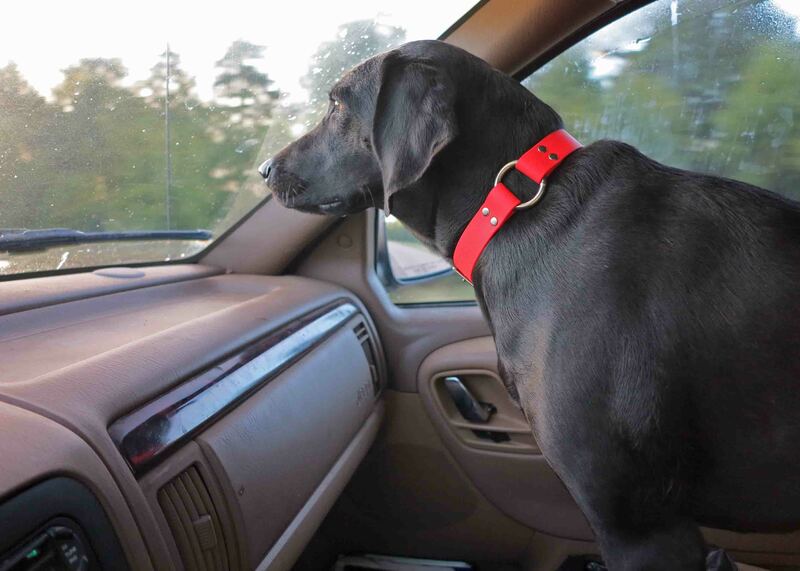 When I finally said, “up,” she jumped into position, ready for a road trip to whichever trail it might lead. Hiker heading toward the trail head. 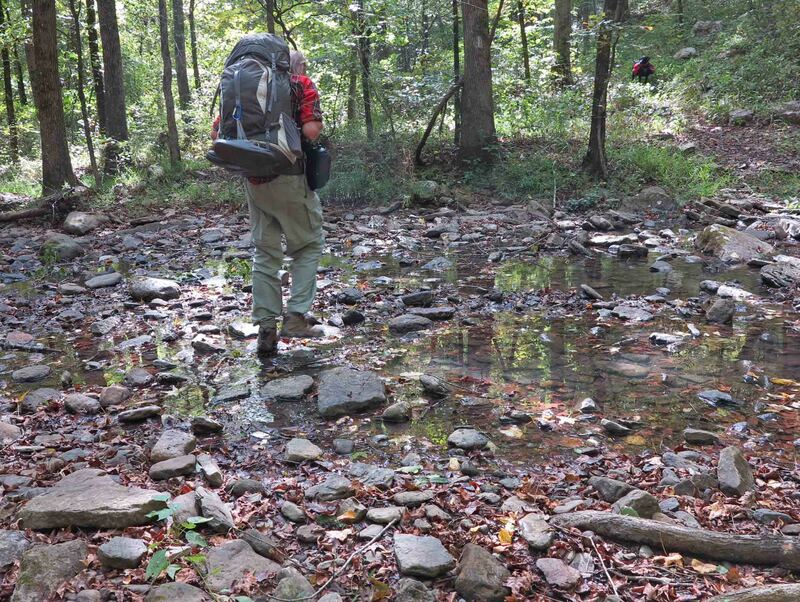 We’ll have to call this the “pawpaw hike.” Fanes Creek west to Spirits Creek treks through several pawpaw patches. 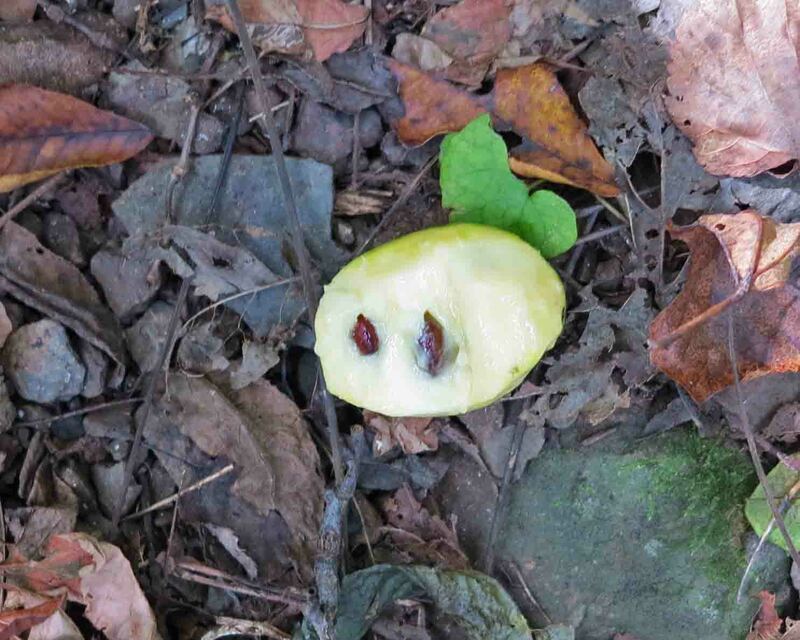 I was unfamiliar with this little fruit, but Dana, one of our hikers, pointed them out as we passed. The first ones we saw were overripe and a little bitter. 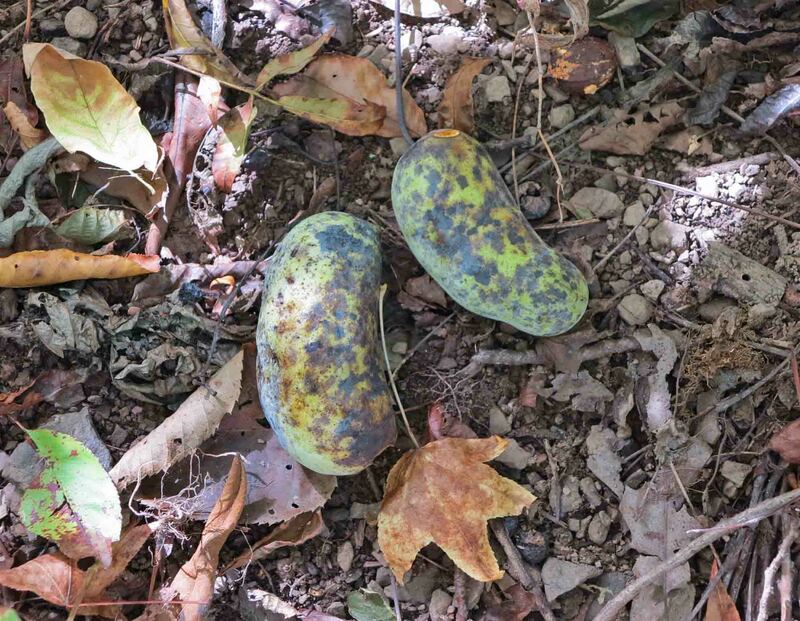 These two pawpaws were overripe. Later we passed some that were just right. I eagerly cut the skin off of this pawpaw and tried a bite. The taste is described as a blend of banana, mango, pineapple and papaya. I thought this was an accurate description. I ended up eating several before I stopped to think maybe I should proceed with caution because of my lack of experience with pawpaws. 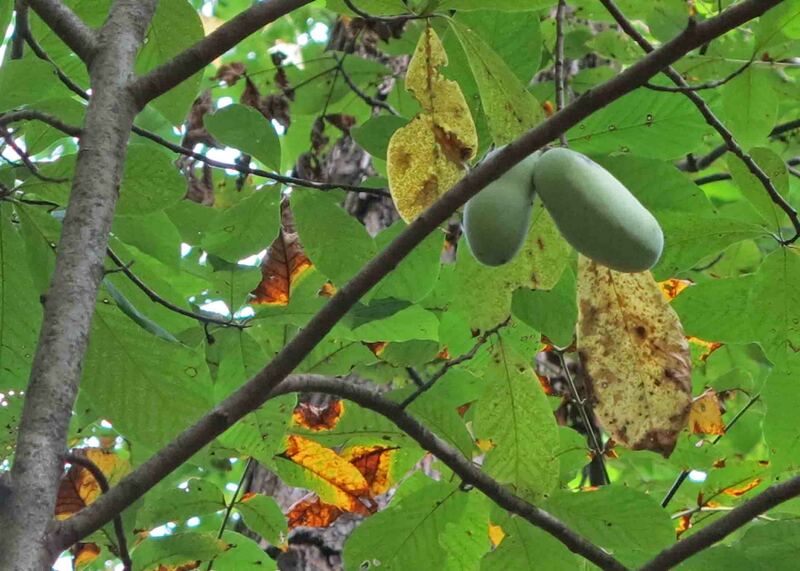 Pawpaws are an understory tree and do not self-pollinate so they need other trees in the vicinity. The upper canopy of oak and sweet gum shaded the tinder looking pawpaw trees. There seemed to be limited numbers of fruit on each tree and great variation in the maturity of the different trees. Pawpaw showing the meat and seeds of the fruit. 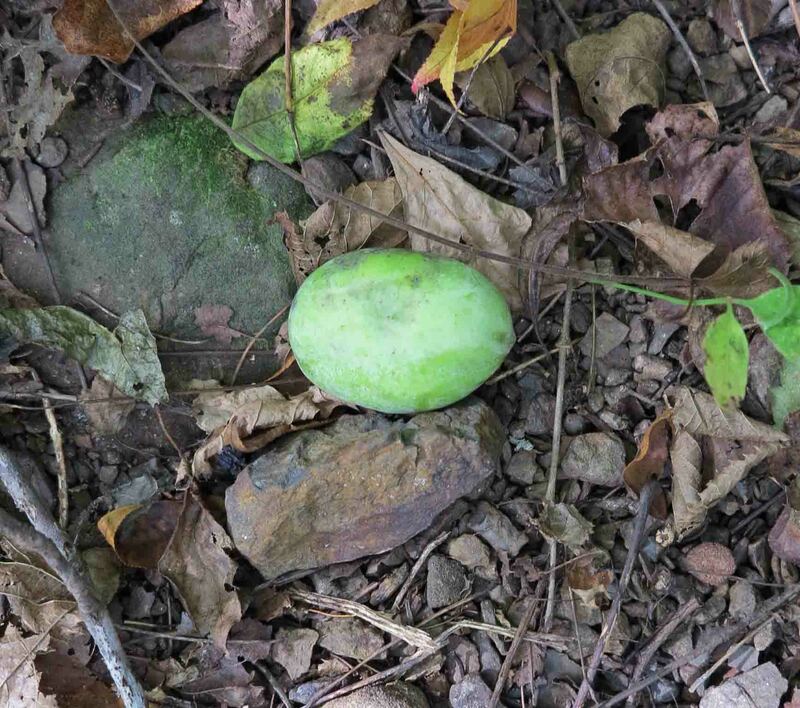 If I find pawpaws growing close to the road, I would like to try mixing in some lemon juice and dehydrating a pawpaw “leather” as a backpacking treat. I saved the seeds from the fruit I ate to see if I can grow a few pawpaw trees underneath some oaks behind our house. This section of trail contains a lot of history. A couple of miles follow an old railroad bed dating to the early 1900s when trees were harvested and transported on a narrow gauge railroad. During the winter, it is easier to see evidence of the work done here. Old bridge footings where the rail line crossed drainages can be seen. Making this railroad must have been a major ordeal, but evidently the line worked for several years. Hiking the old railroad bed. 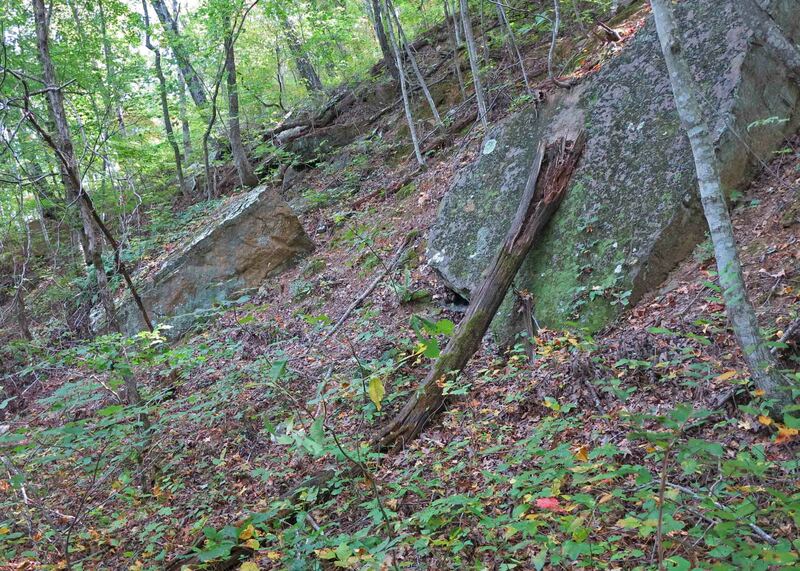 Boulders sliding down the sides of the old excavation for the railroad bed. Water in the creeks was just right for drinking but low enough for dry crossings. The lower water levels gave an opportunity for Hiker-dog and I to spend a little time after dinner walking down Spirits Creek. Bob stepping across Spirits Creek. Hiker with her food supply for two days. 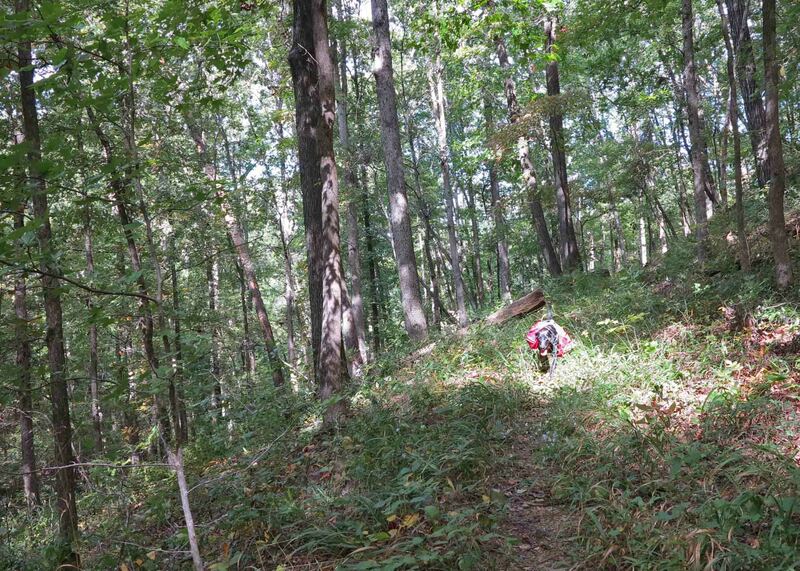 Hiker is in her element when walking the trail. She is poised and confident as she struts along. One exception to this was on the first day. She got turned upside down in some brush and spent several seconds frantically trying to right herself. She looked like a big turtle with a red shell. Finally, she was able to gain a hand…paw hold and flip herself over. We told her we were laughing with her, not at her. Unfortunately, I do not have a picture. Seeing Hiker with others in camp was interesting. She has a habit of being a little too friendly when people are trying to operate stoves and prepare meals. I’m thankful that she does not chew on tents or other pieces of equipment. However, I do wish that she would be a little less affectionate in camp. I’ve noticed that Hiker does much better in camp after walking ten or more miles for the day. We only hiked seven so she ended the day with lots of energy. To divert her attention, we played fetch with sticks and black walnuts. Finally she bedded down for the night. Bedding down for the evening. Water was easy to filter at Spirits Creek. It was clear and looked good enough to drink without filtering, though I wouldn’t recommend it. 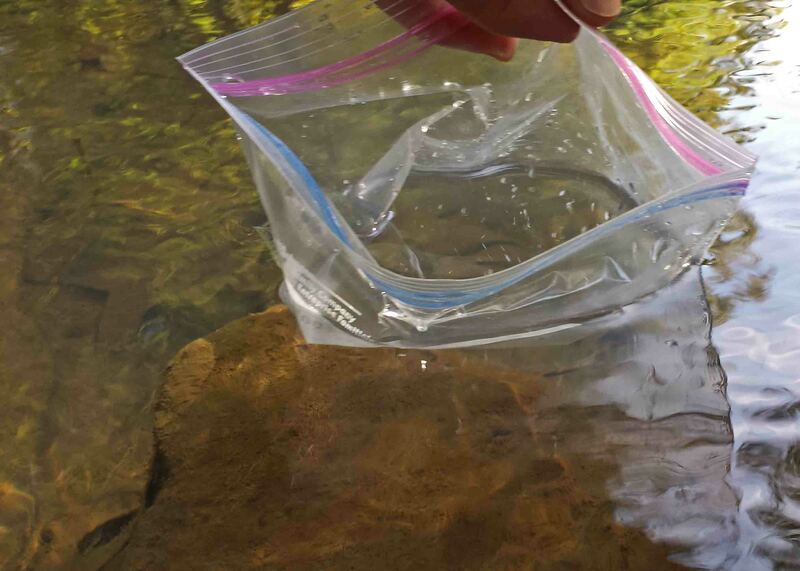 Collecting drinking water using a ziplock freezer bag. 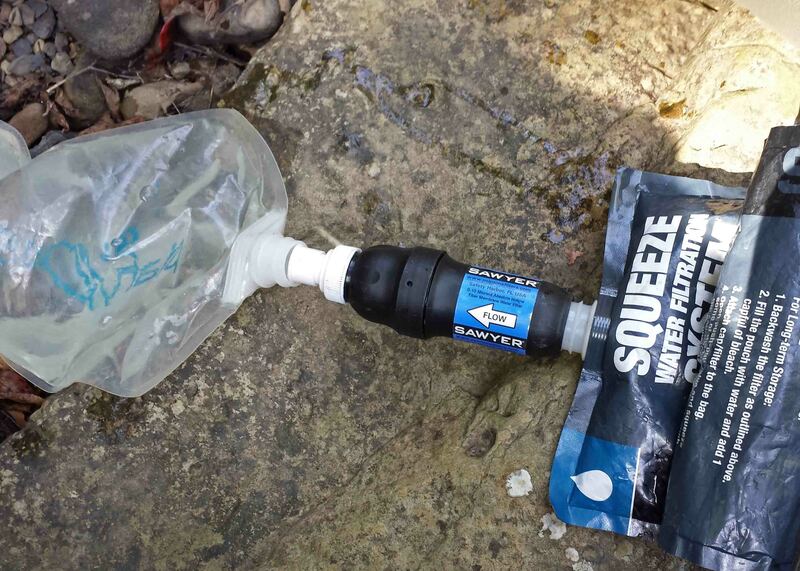 Filtering water from Spirits Creek. I brought plenty of food for this overnighter. I had a couple of red potatoes in the bottom of my pack (hence, my trail name, Tater). I cut up the largest and began to boil it adding dehydrated vegetables from the Huntsville Pantry that were a gift from a friend. Then I added Bear Creek Creamy Potato Soup Mix and let it simmer. This was a healthy and delicious feast with all of those vegetables! After a cup of hot tea, I slept soundly. 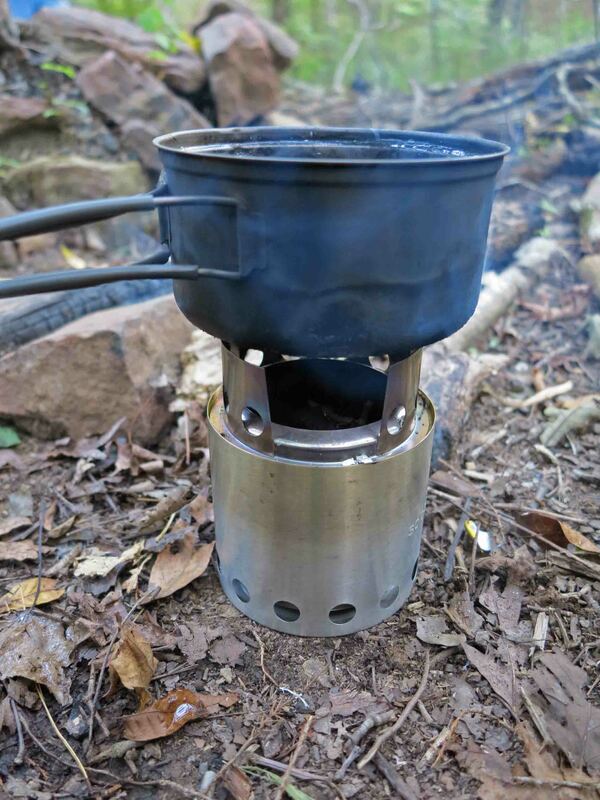 The next morning I had two cups of coffee which tasted like a gourmet brew on a cool morning in the Ozarks. I boiled water with dehydrated apples and then added oatmeal. Outstanding! Next, I put several slices of pre-cooked bacon in boiling water with the smaller red potato remaining in my pack. 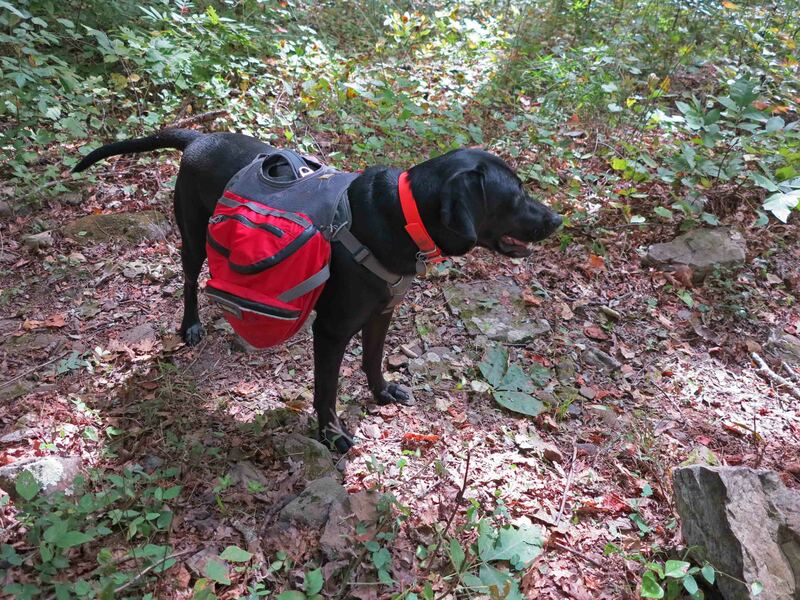 I couldn’t stand the idea of hiking out with that “heavy” potato in my pack. I was well nourished and ready to hike. Fane Creek was flowing slowly. We were unable to cross this creek on our winter thru-hike due to high water, so this was a different view of this beautiful creek. Knowing my trip was drawing to an end, I paused and spent a couple of minutes at the crossing. 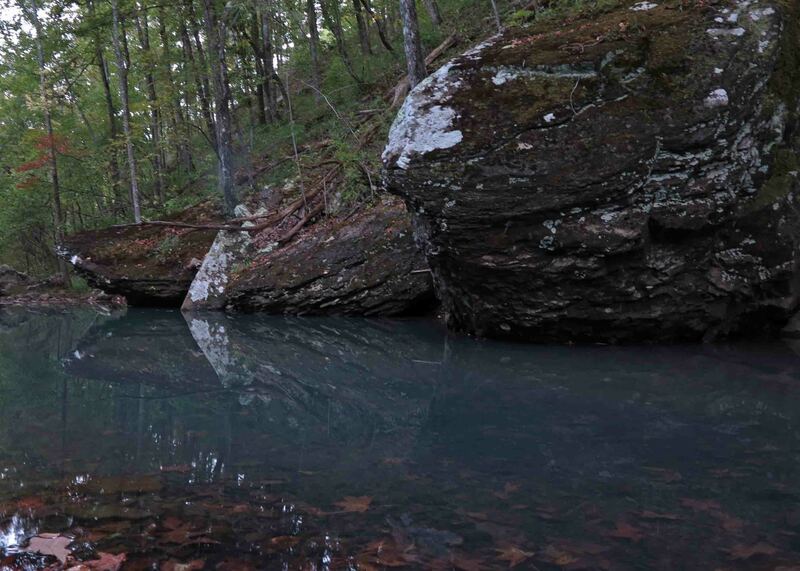 I’m thankful for the beauty of the Ozark Mountains and the privilege of hiking them. 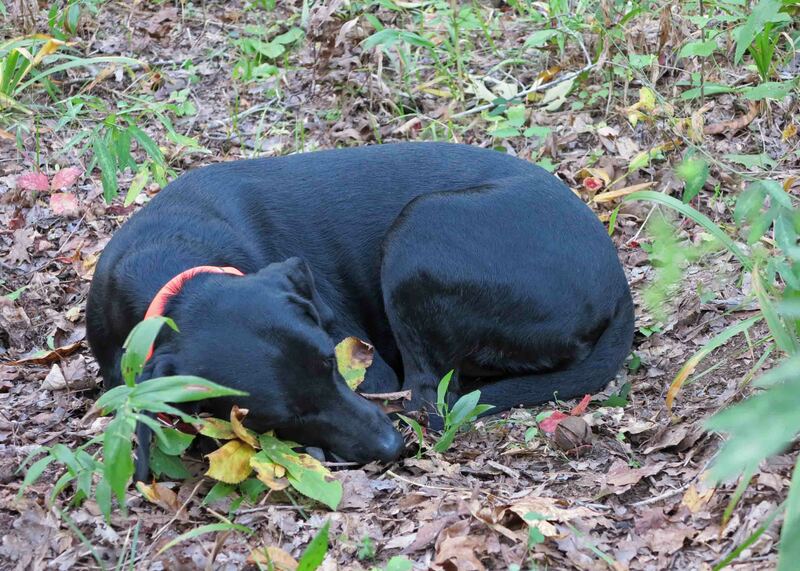 This entry was tagged Fane Creek, Fanes Creek, Ozark Highlands Trail, Pawpaw, Spirits Creek, Turner Bend Store. Bookmark the permalink. Truly fascinating. You’re the kind of Thoreauvian guy I wanted to be but I never made it.